Have you got yourself a Minolta 5400 scanner? Want to know how to get the most out of it? Well, thankfully Johan Van Huyssteen has taken the headache out of the equation by writing this how to guide. Strap up, it is a long one. It’s important to know right here and now that this is not a Vuescan vs SilverFast thread. This is a story of ‘SilverFast 8’ meets ‘Minolta Dimage Scan Elite 5400’ and how to get them to make sweet, celluloid love to each other. This article will read very much like a luxury point-and-shoot review, as in, budget is of a low concern. This brief guide will not focus on scanning grandpa’s vast collection of slides. The goal is simple and clear: extract the highest quality image attainable from a 35mm transparency, just short of a PMT drum scanner. Why not shoot medium format you may ask? Well I do, but many of this site’s readers find a Mamiya 7, Plaubel Makina, press camera or folder camera still too large. 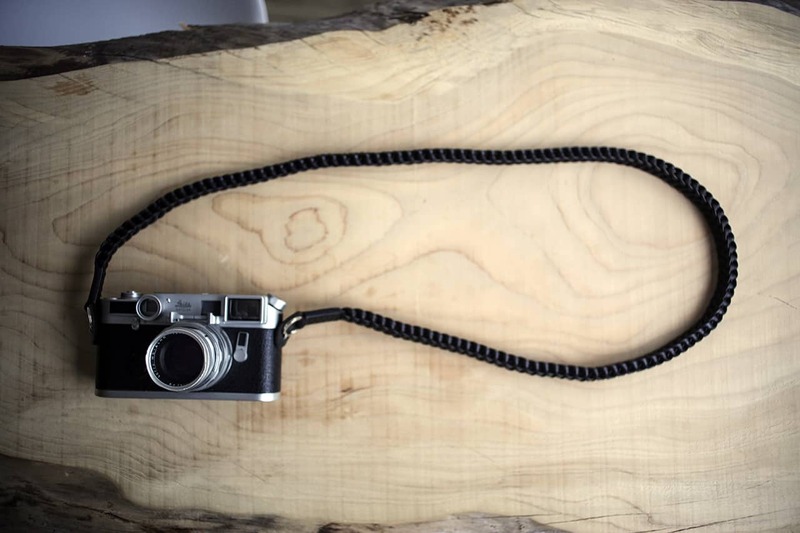 I also want fine art prints from cameras that I carry around with me all the time. My Epson V550 might be fine for 6×7, it didn’t cut the mustard for 35mm. Not even close. The Vuescan vs SilverFast debate settled itself nicely. A few years ago, I purchased the Minolta second-hand off eBay for about 350 pounds sterling. By then, Minolta’s own software was long obsolete. I had to start somewhere, so I gave Vuescan a go and used it for many months. I wasn’t satisfied with my results so I did a blind-buy of SilverFast Ai studio 8. The manual focus was cruel in its sharpness. I was also getting about a stop more detail in the highs with negatives and 2 or more stops of exposure in the shadows on slides than with other software (when using multi-exposure). Lastly, the software is fully licenced to access the scanner’s hardware-based infrared dust & scratch removal technology called ‘ICE’. It is simply in a league of its own. Vuescan’s software based approach to dust & scratch removal is utterly useless in my opinion. I am aware of users’ complaints that SilverFast doesn’t play nicely with many Epson flatbeds. I’m also aware that Epson Scan (and other programs) applies software-based sharpening by default. End of comparisons. It is crucially important to know that Vuescan and SilverFast are the only two ways of getting this scanner (and many older ones) to work on Windows 10 (64bit) and Mac OS X 13 (64bit). From here onward I’ll jump straight into the guide, numbered chronologically. Try to follow this order in your workflow. 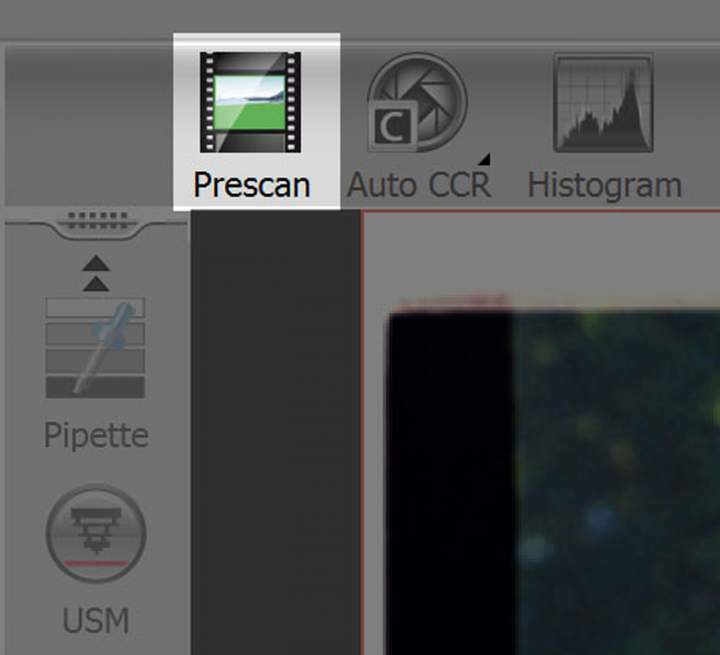 Prescan scans the first image in your film-holder as a low-resolution preview. ‘Overview’ scans all the images in your film-holder as low-resolution previews and spits out the thumbnails. You can skip this and prematurely hit the ‘batch scan’ button at the top of the GUI, but that means you can’t refine any settings before you do. ‘Refresh thumbnails’ every time you load new film. ‘Close dialog’ and nothing will be added to a queue. The first image of the holder is now ‘prescanned’. All settings from here onwards, will be applied to the batch scan. You can crop all your frames by grabbing the handles marked in the figure above. 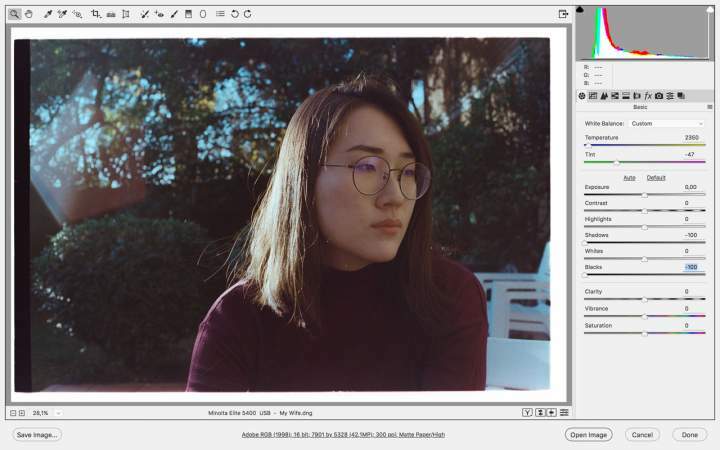 I always keep overscan, so that I can use the border for white-point colour balancing and also, I despise the act of labs cropping in too much. One can also flip or rotate all images’ orientation if required (see above). This is where it all starts. Actually, SilverFast, wants you to use their ‘unique’ ‘WorkflowPilot’ which automagically shows you what to do and in which order. It’ll just confuse you and make you miss some other important features. Stick to this guide for nirvana. ‘Transparency’ is obviously the only concern for this article, but with flatbeds you can scan other material. 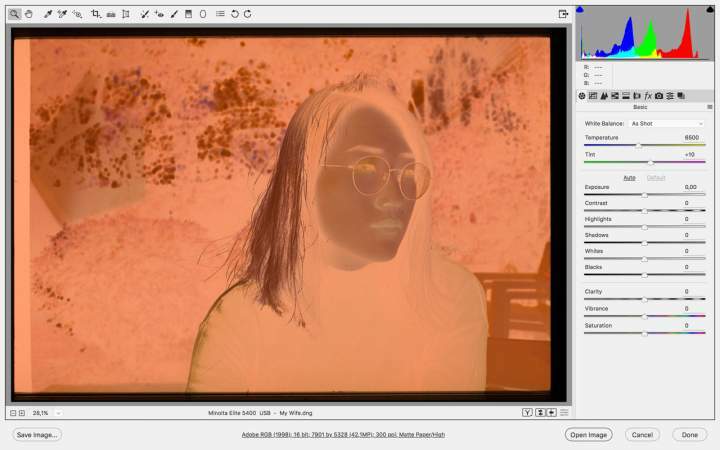 ‘Negative’ can dropdown to select ‘Positive’, which simply changes the colour presets available for use with slides, and tells the software not to invert the image when outputting a ‘.dng’ RAW file. SilverFast scans all colour films at 48 Bit colour (16 bit per channel), but you do have a choice in how it’s saved. 48 > 24 Bit = 8 Bits per channel (R, G, B). 48 Bit = 16 Bits per channel (R, G, B). 48 Bit HDR RAW = 16 Bits per channel (R, G, B) *, **, ***, ****. 64 Bit HDR RAW = 16 Bits per channel (R, G, B, infrared) *, **, ***, ****. All grayscale images are scanned at 16bits (which means 65000 shades of grey in B+W terms). Again, you only have an option of how it is saved. 16 > 1 bit = 2 shades of grey. Black or white. Useless as far as I’m concerned. 16 bit = 16 bits = 65 000 shades of grey. 16 Bit HDR RAW = 65 000 shades of grey + additional stops of exposure dynamic range, ready for Adobe Camera Raw processing. Amount of stops exposure dependant on measured ‘Dmax’ value of scanner model. *, **, ***, ****. 32 Bit HDR RAW = 65 000 shades of grey + 16 bit infrared data + additional stops of exposure dynamic range, ready for Adobe Camera Raw processing. Amount of stops exposure dependant on measured ‘Dmax’ value of scanner model. *, **, ***, ****. * Requires a non-bitmap image format like DNG to be selected from dropdown menu. ** Requires a multi-exposure enabled scanner, like Minolta 5400. *** Requires ‘ME’ (multi-exposure) option to be enabled in SilverFast. **** Requires additional software (like SilverFast HDR studio) that can utilize infrared data for compositing task e.g. instant, highly accurate dirt and scratch removal via ‘ICE’ technology. The ‘Frame’ option can be ignored as we’ve already adjusted the crop with the handles. ‘Name’ and ‘Path’ are self-explanatory. Next to ‘Name’ you have a dropdown of output file formats. I always keep it on TIFF, unless I’m doing scans for fine art purposes, in which case I’ll select DNG (needs multi-exposure scanning). ‘Opt’ is for formats that give additional compression options. The ‘IPTC’ button is for embedding metadata, if you find that useful. ‘Format’ is something I leave untouched as it automatically reads the data from the crop you’ve setup earlier. Next to that are ‘landscape’ or ‘portrait’ orientation, which is also overwritten by your crop settings earlier. The ‘Preset’ and ‘ppi’ buttons have literally no effect on any scan I’ve ever done. The manual states that it is for metadata purposes. Skip it. ‘Res’ is critically important. I really encourage you to read both the manual of your scanner and trusted reviews online, to find out the measured ‘PPI’ (pixels per inch) of your scanner’s sensor. Most manufacturers incorrectly use the term ‘DPI’, which is related to printing density. At any rate, it’s worth noting that many manufacturers outright lie about this figure to sell their products. The first thing they lie about is listing upscaled resolution as optical resolution. Upscaling can be done very simply in any image processing software and simply re-samples an image. It has nothing to do with image sharpness. Unfortunately manufacturers’ lies don’t end here. The optical resolution is supposed to be the true, measured PPI resolution of the scanner, before upscaling occurs. I want to dedicate at least one paragraph to the optical brilliance of the Minolta 5400. The nominal, optical resolution has been confirmed to be 5400 PPI (that’s 42 megapixels; 6 more than a Nikon D810). Then there’s the lens… the lens is the pure black magic. Robert O’Toole, a ‘BBC Wildlife’ awarded photographer based in California, was very curious about why the Minolta was so much sharper than any other consumer scanner. So curious, he decided to go full Frankenstein (see the same link above). He purchased a Minolta 5400 scanner (two actually), only to strip it and remove the planar lenses. 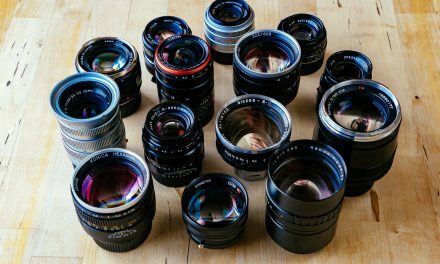 He then had a company called RAF put some drawings together and created a custom little lens adapter, which screwed into a crazy-looking M39 adapter, which screwed into a Sony E-mount adapter. This produced a flawless full frame digital image. The Multi-exposure function is crucial for artists wanting to extract all available chroma and luma values from a transparency. Once in a while I feel confident enough about a picture that I want to print it large on a wall. Multi-exposure isn’t going to give you larger prints, but as you know if you’ve ever worked with chromogenic prints; the larger you blow it up, the more junk you’ll reveal. Now select 48 Bit RAW from the bitdepth button discussed earlier and select ‘DNG’ from the file output dropdown. *For a deeper understanding of film density, I suggest a read-through of Ansel Adam’s book ‘The Negative’. ‘Negafix’: select an emulsion preset. Kind of gets you where you need to be, but obviously it doesn’t take into account your scanner calibration. Exposure is self-explanatory and ‘Tolerance’ simply adjusts tint. 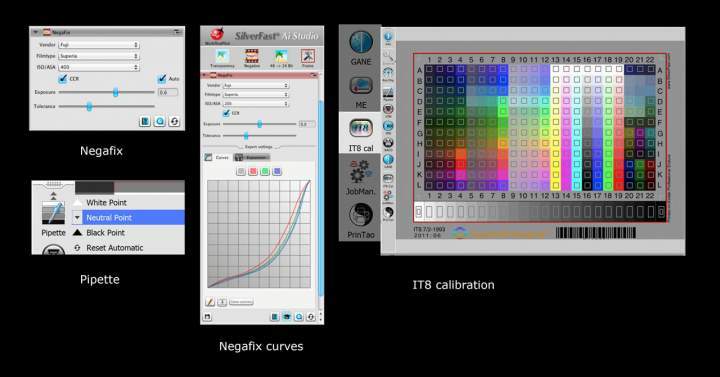 ‘Negafix’ curves: accessed by opening the ‘expert’ options under the negafix tab. Adjust point curves for each colour channel as you would in Photoshop. You can save it as a preset. This is an eyeballing method. Avoid if possible. ‘Pipette’: Sample middle grey, pure white and pure black. Very accurate if you shot grey cards. Really fast. IT8 cal: IT8 calibration means 100% colour accuracy (additional targets purchase). 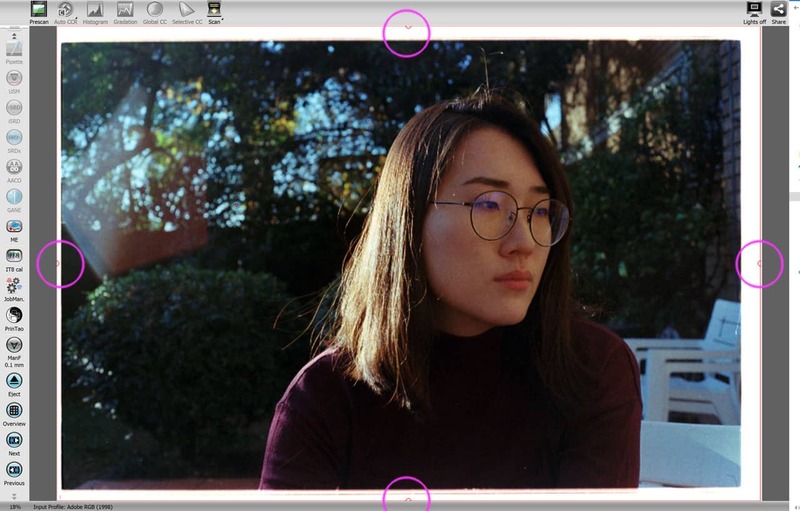 Pop 3 targets into your film holder, click the ‘IT8 cal button’ and when it’s finished scanning, you’re colour will be perfect for life on all slides and negs of different makes (unless you feel you need to recalibrate). 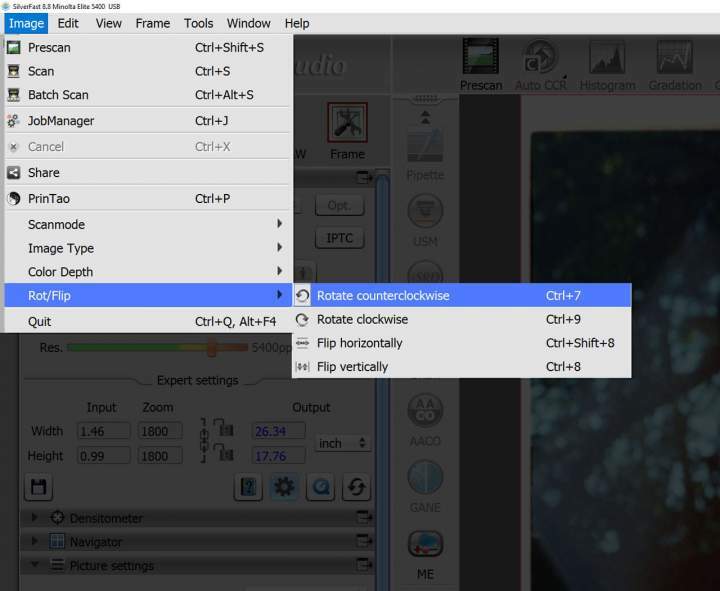 Focus adjustment is a feature only available in scanners with the functionality. If, for example you use an Epson V550, the icon won’t be visible in your version of SilverFast. SilverFast’s manual focus works zealously with the Minolta. The AF modes don’t work properly. Select ‘Manual Focus’, then click on a high-contrast area, which will bring up the ‘Focus Preview’ window (see figure above). ‘OK’ confirms, settings. ‘Point’ lets you select another preview area. ‘Update’ does exactly what it says after you adjusted your values (by using sliders or punching in your own values). Again, ‘Auto’ is rubbish. ‘Cancel’ reverts to previous settings. I already mentioned SilverFast’s hardware-based, licenced support of the scanner’s infrared dust & scratch removal called ICE. There are scientific papers written on this topic, but all you need to know is that ICE uses the infrared beam (if your scanner has one) to see behind dust and hair particles and reflect the underlying silver halide crystals. It can then easily reconstruct the chroma values in those areas, because it has the physically correct luma values. It also detects depth differences between scratches and emulsion base-height and attempts to reconstruct those areas using surrounding pixels. In short, it works perfectly for surface particle matter and less so with scratches (but still better than software-only reconstruction, SRDx. Kodachrome users take note. SilverFast is the only software that can use iSRD to correct defects. One exception is the Nikon Coolscan 9000ED, which had its own dedicated version of ICE just for Kodachromes. Lasersoft developed their own profile for SilverFast, to deal with the way Kodachrome’s silver halide responds to blue light wavelengths. Below the ‘Pipette’ button is the ‘iSRD’ button. There are 2 preview buttons. One is a marque area (not 1:1 magnification) and the other is the 1:1 preview, which can be seen in the screengrab. 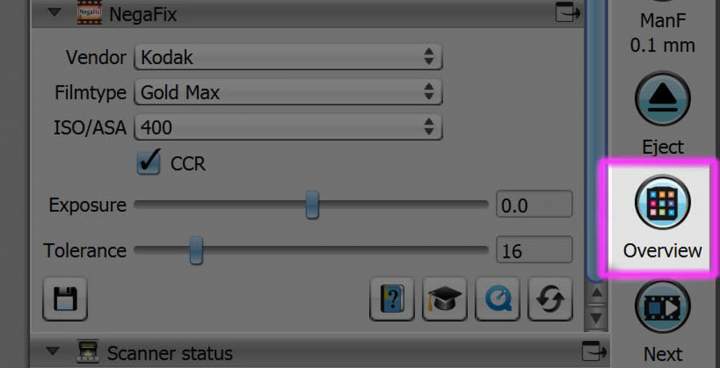 The ‘Correction’ dropdown, lists ‘Mark’ which highlights the detected dust, ‘Correct’ previews the reconstruction and offers fine tune control via the ‘Detection slider’, ‘Automatic’ does the same, without any fine-tune sliders. Be patient, as the scanner will need to do another prescan for the infrared channel. *I’d like to mention that I very seldomly use any dust removal as my lab is very professional and clean. The particle matter that does remain, is much faster to clean with a Wacom pen and Photoshop’s content-aware brush. But painting 36 exposures of soiled film is a nightmare. I’ve had entire rolls ruined by labs when traveling. In these cases I set up the dust-removal, batch scan and return when it’s finished. This is the final step before you create a digital image! ‘Scan’ will only scan the first frame of you film holder, or a frame you highlighted from the ‘Overview’ pop-up window. By default, ‘Batch Scan’ will scan all frames in your film holder. The alternative is to select a few frames from your ‘Overview’ window and it will scan that selection (every time new frames are loaded too). It will also show a pop-up window allowing you to set indexing, frame padding etc. I find it quite useful. There is another batch facility called ‘JobManager’. I never use it. It is more suited to machines that can scan an entire roll/ or more at once. It allows batch RAW commands , framing dimensions and cleanup processes for use later in Lasersoft’s ‘HDR Studio’ software (additional purchase). The screengrab above is from Adobe Camera Raw. If you selected the ‘ME’ and DNG RAW output, you truly do get a digital negative, meaning the colours are inversed and uncorrected for orange masking. The ironic beauty of SilverFast’s additive HDR system, is that a RAW file does not have the ghastly HDR look (everything looks like it’s tinfoil). It is nearly identical in appearance to the normal TIFF scan, only with extra dynamic range. With 3 clicks, you can set up a preset to deal with the orange mask for all future RAW scans. Assuming you shot a daylight balanced stock (most films are) you can punch in a value of 2300 in the temperature slider and -50 in the tint. Now go to the ‘Tone curve’ and invert it as shown below. The resulting image is a colour positive. Remember, other than contrast and temperature, all other settings will work inversely until you rasterize the image (turn it into a bitmap image aka pixels). Highlights will be shadows and vice versa. Once you’re in Photoshop everything works normally though. This can be done in batches, by using Lightroom or Adobe Bridge. The latest versions of Adobe Camera Raw allows built-in batch processing. I find it to be much faster and less clumsy than Lightroom. SilverFast is an overly-complex piece of software. That’s what you get when you have to accommodate for 3 decades worth of scanner drivers and technologies. Follow this simplified process and you’ll be shooting more and scanning less. The software is highly optimized for this scanner. Combined with the supernatural optics of the Konica Minolta Dimage Scan Elite 5400, I get 42 megapixels of perfection corner to corner. The results are so good; I would compare a scan from my Nikon F4 + AI-s glass to the same lens on my personal Nikon D800 (36 MP). Naturally, there is a massive difference in grain vs noise structure. If you hated grain, you wouldn’t be reading this site though. I would go as far as saying that if I shot the same picture, with both cameras mounted with AI-s glass; the F4 with Fuji Provia 100F would be indistinguishable from the D800 at ISO 200… possibly even better due the digital sensor’s problems with moire, chromatic aberration and sharper highlight falloff. I’m going to back that up even further, by linking you to high-resolution exposure I created in Seoul, South Korea a few years ago with Agfa Precisa 100 and scanned recently. I think the image should do the talking. The image is extraordinarily clean considering that grain multiplies exponentially with every stop of exposure gained through longer shutter speeds. This exposure had a shutter speed of 1 minute. Lastly, the Minolta scans in Adobe RGB colour space. I recommend you to keep it that way and assign an sRGB colour profile in Photoshop. Adobe RGB has a wide colour gamut that attains much, much more colour information than sRGB. 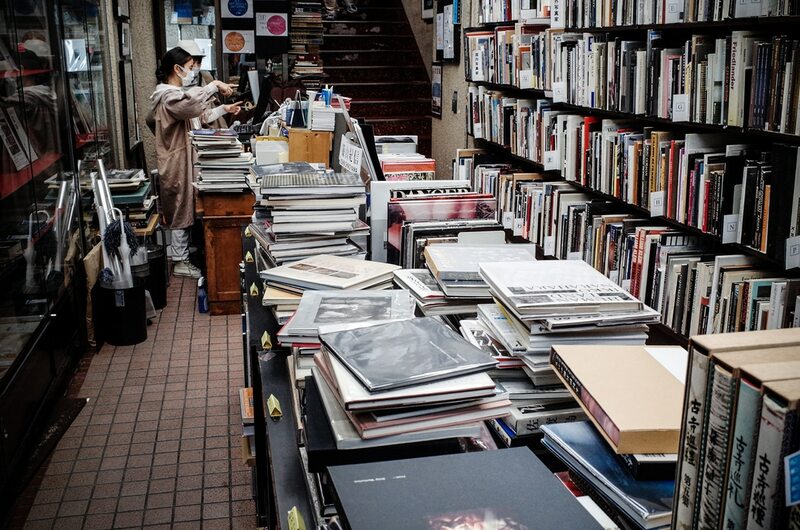 If you’re storing a 16bit image, it’s invaluable to have all the information at your disposal. Even more so when using ‘multi-exposure’ and RAW DNG. I suggest making your primary colour correction and exposure adjustment once. Then bake it in Photoshop by going to ‘Edit’> ‘Assign Profile’> ‘Working RGB (sRGB IEC61966-2.1). With RAW files, the interpolation is less predictable if baked from Photoshop. If it doesn’t look identical to the Adobe RGB version, try baking the sRGB profile directly in Adobe Camera RAW (click on a small line of text at the bottom of the window). Again, this only affects how it is saved. The RAW scan will always contain the full Adobe RGB colour gamut. Please ignore the ‘Preview’ as it is inaccurate in its ‘depction’. The picture should now be indistinguishable from the Adobe RGB profile. You now have a lesser colour gamut, but unfortunately sRGB is the most widely used colour space in computer graphics. I truly hope you find a scanner + software combination that works for you! Thank you for your time. Let’s keep this beautiful medium alive. Thank you to Johann for this really comprehensive article. As always, comments are welcome and polite discussion encouraged. Great, in-depth article. 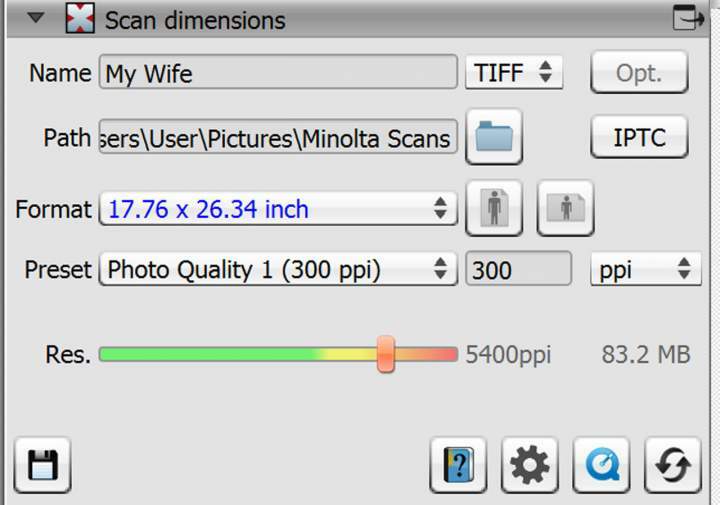 Just a question, would this work workflow be applicable to the Pacific Image scanners for example? I have a 5400 II. Interesting that they haven’t updated Silverfast Ai to version 8 for this scanner. Odd! @ Pureum. Yes it sure will! This article is applicable for most scanners. Variations will be based on tray holder size and layout, manual focus, multi-exposure and ICE, which is entirely dependant on scanner hardware. Curious to know how this would compare against digitizing with a D850 and a macro lens in terms of sharpness and exposure latitude. Any RAW files that we can download and examine? @Michael. That’s a great idea. I’ll upload an example this weekend! * Picture is not in focus (in camera). This picture demonstrates dynamic range nicely. ** As indicated in the article, it is a camera NEGATIVE, meaning controls are inversed. ‘Shadows’ will control highlights and ‘Highlights’ will control shadows. *** Please note, it is a copyrighted image and any distribution of it is punishable by law. It is also a very private picture to me, so please use it for your own educational purpose only. will any version of silverfast work with this scanner or do you reccomend a particular one? thanks for this article, top notch!! @Mm; yes and no. Every version of Silverfast is customized for that scanner and its features only. That custom code and the ICE licensing is why the software is so expensive. 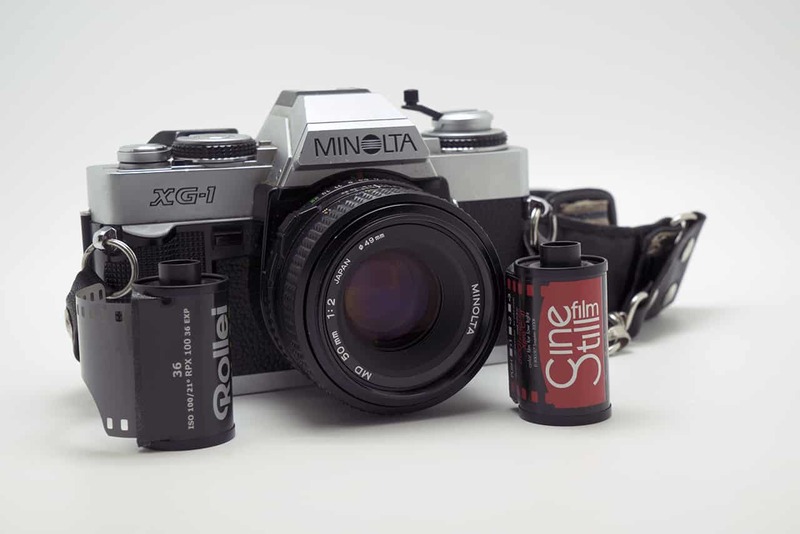 In other words; I actually have Silverfast 8.8 for Minolta 5400 I. It literally can’t function on any other scanner, not even Minolta 5400 II. But, Silverfast 6/7 for Minolta 5400 I will work fine yes. Any reason you’d want an earlier version? @johan i ask because i would like to get into scanning my own color film and have the opportunity to purchase this scanner which you highly recommend. having never scanned my film before your article and setup is a big help to me, but i have to admit that i am computer illiterate…therefore i would like to know what version of silverfast i should buy. @Mm: if you’re not confident in your computer skills yet, I wouldn’t recommend Silverfast. It’s quite advanced and you need to understand some basic concepts about digital and film images. Perhaps do a small course on colour correction in Photoshop (thousands available for free online) then get a flatbed scanner like the Epson V550 (very cheap) and use the free ‘Epson Scan’ software. Those 3 things should get your very far as a beginner scanner and image processor. Even if you have the money to burn for the expensive Minolta and Silverfast, you might not have a lot of fun figuring them out. @johan: thanks for the advice! i will hold off until i better understand the software, again thanks for this great article! Thanks for the DNG. I’ll look it over. And of course, I won’t distribute it or use it for anything. I’m just curious, really. @Jaroslaw. Thanks for the interest. I recommend Silverfast 8 (point updates, like 8.8 just improve performance and bugs.) I also recommend you purchase SE Plus, or Ai Studio. They’re the only versions that support multi-exposure. Furthermore, Ai Studio supports advanced options (called ‘expert mode’, which gives you a lot more control for things like curves and creating presets. If you have the money to drop, get the Archive Suite, which bundles Silverfast HDR. This basically allows you to remove infrared dust and scratches from a RAW file. 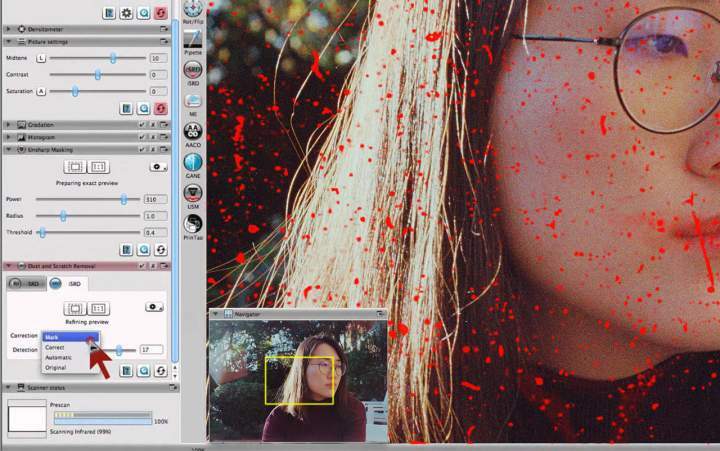 Silverfast Ai Studio alone, only allows you to remove infrared dust and scratches from a TIFF file. Might be minor or major to you. So basically, in rising order of awesomeness it’s SE Plus, Ai Studio then Archive Suite at the top. The prices differ quite a lot, so be aware. thanks a lot for the great article and you advise regarding silverfast. I will try SE Plus and later check for the more costly versions. Over 30 years I have had 4 35mm film scanners starting with the Abaton in 88, followed by the first Epson “film” scanner they only ever made one then a Canon FS something or other and have just taken delivery of a Plustek then there have been a few flat beds. The first three all became obsolete, software, connection bus, capability. 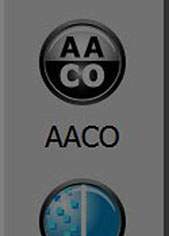 I have used Silver fast on all except the first two and I have to say there is nothing to touch it. Unless it has changed in the last couple of versions which I haven’t used I would say to anyone just use the Auto mode till one feels comfortable with it then follow your excellent tutorial. It can be very slow, the more RAM and an SSD will help. Try and only run Silver fast and have no other app running that also helps. In batch mode the frame selection in the last version I had was always tedious and oh so slow, I hope sincely hope that auto mode has improved in the one I have just bought. This time around I have set up an old Mac Pro just for scanning its s the best use for a legacy computer! @Michael. Thanks for the anecdote! I too can confirm that Silverfast is very RAM heavy. When I edit and scan on my 16GB Macbook Pro it dies. When doing the same on my Desktop with 64GB RAM it flies! Again, thanks for pointing that out. I should have mentioned that in my article. Excellent article. I, too, have a Minolta 5400, and also a Nikon Coolscan 9000. Likewise, I was dissatisfied with my Vuescan results but I erroneously believed I was stuck with Vuescan, or, the ludicrously expensive Silverfast option, despite my sneaking feeling that the original scanner software was/is the best. Well, the solution was unbelievably simple: I partitioned my Mac hard-drive, installed the older Leopard OS (Snow Leopard is also capable) onto the new partition, then installed the original Minolta 5400 software, and also Nikon Scan V4. Job done. Now both scanners are fully functional via the software they shipped with – no shock to my wallet, no steep learning curve. I’m a very happy camper. I got a 5400 II for very cheap and it’s in great immaculate shape with box and everything. Anyway, as I’m on newer Macs only and do not have the space to rig my older Macs I decided to do everything in VirtualBox which I already had installed on an external raid. In VirtualBox a XP Professional is running with Minoltas original software doing the scanning and saving it directly to a drop folder I have on my host Mac. From there I do a fast editing with DXO PhotoLab 2 while the 5400 II continues with the next image. When I’m done I do some exports from DXO PL to different sizes and formats and then simply import everything to PhotoSupreme DAM on my server. PhotoSupreme does the versioning of the original and all different exports. After that I begin adding labels and exif data. I’m blown away by the quality the Minolta produces and I kind of regret I kept looking for Coolscans so many years. @Martin, @Petter: totally stoked you guys got.the original software running! Just curious, can you output a RAW dng file from Minolta’s software? Please confirm and post here, as it is a big reason many people keep using Silverfast. Vuescan’s RAW output is shite and unusable so… yeah. Johan, Thank you so much for writing this really detailed article. I now have Minolta 5400. 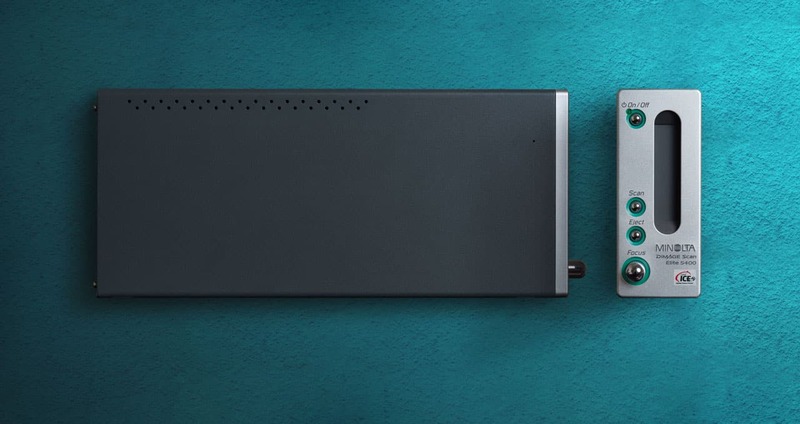 In terms of the Silverfast versions, I was looking to purchase the less expensive Silverfast SE Plus, in preference to Ai. However, only the Ai version allows IT-8 profiling. May I ask how you found the results of just using Silverfast’s generic scanner profile for the Minolta 5400 as compared to profiling the scanner with an IT-8 target? @Guy. The it8 profile is worth it if you don’t know how to match your scans to what you see on a light table. If you do, you don’t need it.